These weren’t carvings by an ancient people suggesting the spiritual or supernatural. They were messages of lust and love, inspired by the ocean and the plasma of all mammalian things alive, scratched into a blank canvas of sand and dirt, messages declaring ideas and sentiments for all the world to see, at least the few people who walked by these cliffs and bothered to pay attention. …some were 50 feet above me, straight up, no footholds, no visible way of getting up there. Except to crawl and hang on. Commitment. Carefree. Precarious. Dangerous. Dumb. Bravado. Wild. Rock and Roll. The other morning, I walked down the beach that boasts perhaps the greatest number of cliff writings on the Oregon Coast, and the highest up I’ve ever seen. I stopped at my usual spot to read the writings. I looked up to see if there were any fresh carvings. (One can determine the older ones because of their faded, eroded appearance. I read it a few more times to see if I was reading it right. I was. Were the cliffs of love really the cliffs of meth? Were all those daredevils high on meth when they scaled the cliffs to carve their pronouncements of love? If it was meth, should I feel outraged about the desecration of my ideal? Sorry for the carvers? Happy for their frenzied urge to carve with the ocean rolling behind them? Am I skeptical of these messages of love? Should I be thankful for their carving when they could be doing something much worse with their meth time? Should I appreciate their declaration of existential being? Hey, they love something! I have learned in recent years to temper initial judgments and dig deeper into statements and questions. Obviousness is so simple, so banal, so loud, and often wrong. 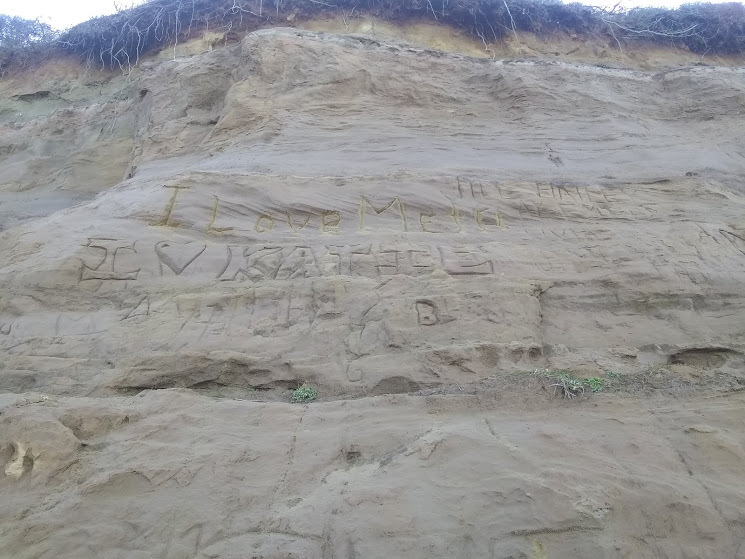 I choose to dig deeper into the sentence, “I Love Meth” carved into a sandy cliff on the Oregon Coast. I will think it over and see where my thinking leads.